It was only a matter of time before the Flick phenomenon made its way to golf. With basically the same mechanic as the popular Flick Kick Football, Full Fat’s new release Flick Golf! 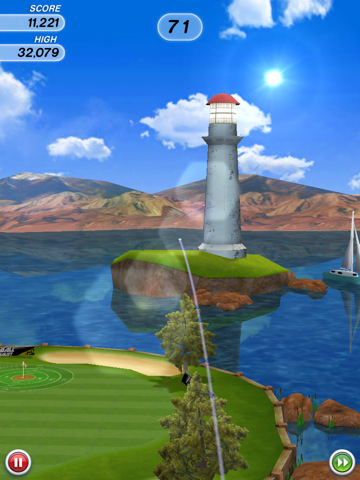 and its iPad counterpart Flick Golf HD ($4.99) is guaranteed to find a following in fans of the genre. It’s worth mentioning from the outset that Flick Golf is not a game for purists. This is not your traditional game of golf – it’s arcade hole-in-one action. 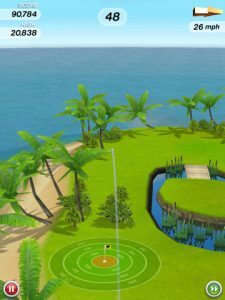 There are two game modes, Quickshot & World Tour and the goal in each is to nail a hole-in-one, or as close as you can get, as often as possible. As you’d expect for a ‘flick’ game, the controls are pretty simple – tap and drag the top of the screen to control the camera and adjust your view downrange then flick. The longer the flick, the further the hit. Most courses also feature wind to some degree, so this also needs to be taken into account when lining up your shot. Once the ball is in the air you can control the path of the ball by swiping madly in the direction that you want the ball to go. The in-air control is a nice touch and generally makes a big difference to the accuracy of your shot. Each hole has a target around it, with higher scores naturally situated near the center. 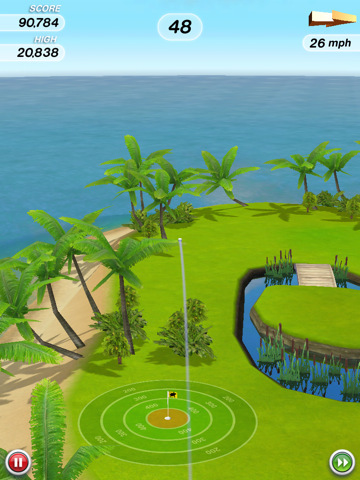 Bonuses are awarded for curving the ball, adding top spin, back spin and sinking 2 or more hole-in-ones in a row. In Quickshot mode there are three different courses, and you get 90 seconds to take as many shots as you can to try achieve the necessary number of points to clear the stage. After each flick, the pin repositions so you’re never shooting for exactly the same spot. 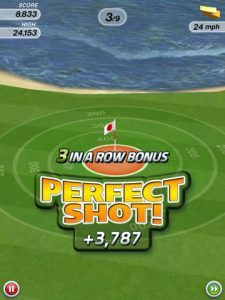 If you land a hole-in-one you’ll get 10 seconds added to the clock, which is absolutely essential if you’re to have any hope of passing the stages – they’re seriously tough. In the World Tour mode you get nine shots at the pin, with varying distance but no time limit. At the end of the game you’re awarded a bronze, silver or gold trophy based on your performance. You’ll need to unlock the silver and gold trophies in the later courses in order to advance to the next round. 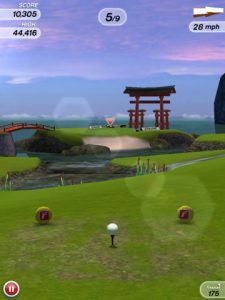 Flick Golf! and Flick Golf HD are both solid pick-up-and-play games with bright and beautifully rendered courses, great physics and a good amount of overall polish. Social integration with OpenFeint gives you access to achievements and leaderboards so you can compete with other Flick fans around the world. The only thing currently holding both of these titles back is the price, which is a little steep at $2.99 for the iPhone version and $4.99 for iPad.